Cartagena. 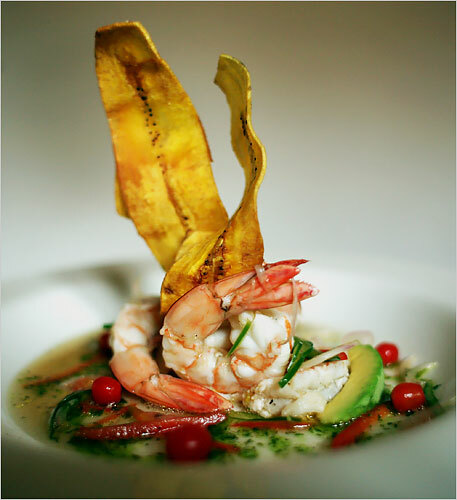 The ceviche topped by a twist of plantain is from there. The sunflower-at-dusk building is the restaurant La Vitrola, tucked in beside the Spanish fortifications. 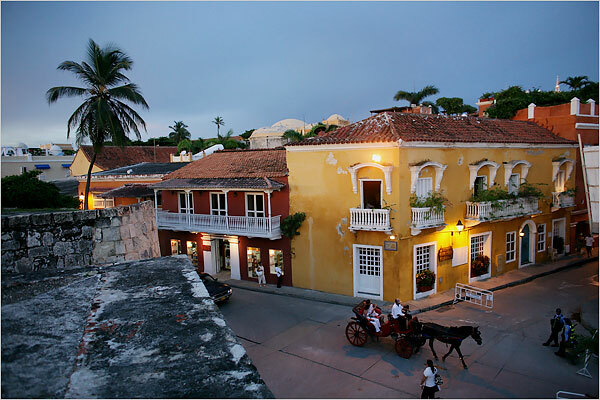 Both are part of the NY Times article declaring Cartagena on the map for foodies and gourmets alike. I’ve eaten at La Vitrola; my financier friend, fascinated by the restaurant, wanted to go there every night. La Escollera, salsa and rum and dancing, is just around the corner. But it’s not the best meal I have ever had in Cartagena. There was a small French restaurant, prix fixe, which produced an extraordinary menu the night my wife and I went there. Even that was no comparison to La Casita Vieja, a small joint in the center, long-closed, where I had one of those experiences I still tell stories about. On the Caribbean coast the typical meal is sancocho de pescado, fish soup. And La Casita Vieja produced a long-simmered soup full of local fish and plantain and potato and cilantro, an extravagance in its richness and freshness. Trying to lure the tourists in, the soup was served in a large carved calabash with a spoon to match. But it was no tourist trap. The ceiling was low, the windows thrown open, and in the Cartagena heat, the fans thrummed and the smooth Colombian beer was the only thing that hinted at cool. I ate and ate that afternoon. So if you are ever in Cartagena, sure, La Vitrola is a great place. But el sancocho, that’s the thing memories are made of. With that introduction, here’s an eclectic foodie round up. Peter Libby, What’s the Healthiest Diet of All? A repeat, I know, but in a different category from last week… Genetic variation in dopamine response and blunted dopamine reactions to a chocolate milkshake while in an fMRI scanner – do certain people want more but get less pleasure? And does that affect weight gain? David Rieff, A Green Revolution for Africa?